Christopher Berg received his training at the Peabody Conservatory of Music, in master classes with Andrés Segovia at the University of Southern California, and at the Schola Cantorum Basilensis in Switzerland. He has performed recitals in Carnegie Recital Hall and Merkin Hall in New York in addition to hundreds of recital and concerto appearances throughout the United States including the Dame Myra Hess Memorial Concert Series in Chicago. His New York debut concert at Carnegie Recital Hall in 1981 was praised by the New York Times for its "special sensitivity." Recent tours have included recitals at the New England Guitar Festival in Boston, the Radford University International Guitar Festival in Virginia, the Appalachian Guitar Festival in Boone, NC, and the University of Michigan in Ann Arbor. 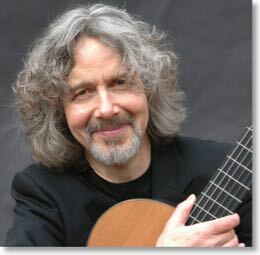 He is a professor of music at the University of South Carolina where he directs the classical guitar program and in 2008 was named a Carolina Distinguished Professor. His students have won top prizes in regional and national competitions. During 1999-2000 he was honored by the University of South Carolina as a recipient of a Michael J. Mungo Award for Excellence in Undergraduate Teaching and in 2003 he was awarded the Cantey Outstanding Faculty Award by the School of Music for performance, research and teaching. In 2003 his former students created the Christopher Berg Endowment Fund at USC, which supports the Christopher Berg Guitar Award presented annually to an outstanding undergraduate guitar student at USC. Christopher Berg also brings early music to life on Renaissance and Baroque lutes and early guitars. His solo performances on these rarely heard instruments are known for their virtuosity and lyricism. In the words of The State newspaper, “Berg, as always, dazzled.” He has performed numerous concerts of Renaissance music with soprano and lutenist Hazel Ketchum, his partner in The Rossignol Duo. He performs Classical and Romantic song literature with soprano Susan Parker-Shimp, his partner in Eurydice's Dream. The Pilgrim Forest, his recording of original compositions for solo guitar, has been released on Laughing Heart Records. Critics have praised it as “a journey through a new geography… nothing less than radiant and compelling,” (The State) and an “uncharted forest of music that is free-flowing, vibrant, expansive and modern — even postmodern” (The Free Times). The Pilgrim Forest was selected as one of the top ten classical releases for 2000 by William Starr of The State newspaper.